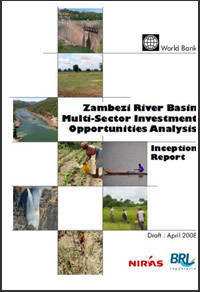 Zambezi River Basin Tourism and Wildlife Conservation Assessment as part of a Multi-Sector Investment Opportunity Analysis for the World Bank, Willie Boonzaaier from Contour Project Managers was appointed as Tourism and Wildlife Conservation Expert by BRL Ingénierie. The project was funded by the Sweden government. The assignment was; to prepare a summary description and carry out a rapid SWOT analysis on the tourism and wildlife conservation beneficial uses in the Zambezi river basin; to advise the Economist and Team leader on the elaboration of development scenarios; to provide the Economist with all needed data, including economic aspects, concerning tourism and wildlife conservation; to contribute to the analysis of the scenarios with the use of indicators concerning tourisms and wildlife conservation; and to assist the team in analysing the existence and opportunities of Public Private Partnerships (PPP) in the tourism sector and in all the project sectors.